Yesterday, the Cleveland Indians and The Plain Dealer partnered together to put on the annual Tribe Reporter for a Day event here at Progressive Field. This event has been an annual thing since Chris Perez last had short hair. The purpose of Tribe Reporter for a Day is to give high school students the chance to be, well, to be a reporter for the Tribe for a day. We are very creative with our event names. High School students were asked to submit essays to The Plain Dealer telling why they are interested in sports writing and how taking part in this event would further their future career plans. 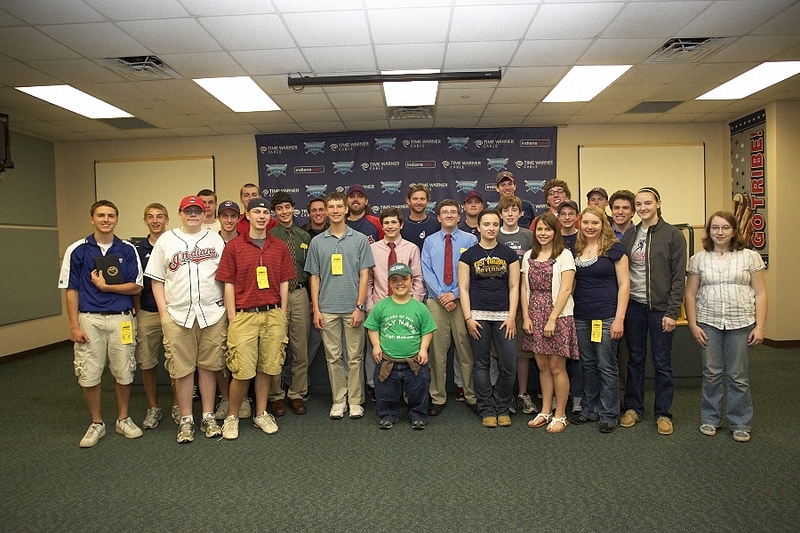 Out of about 200 essays, the top 25 were chosen and those kids were brought to Progressive Field on May 10, 2011. The day began with them sitting in on an actual press conference with Manny Acta and the local media. After the press conference, Plain Dealer sports writer, Paul Hoynes, spoke with the young reporters. He gave them some insight on his world as well as some tips on how to make it in the business. After a few questions/answers, they were taken to the stands to watch the Indians take some batting practice. During this time, they were looking through their media guides and getting some notes/questions together for their own press conference with some of the players. Shortly after batting practice, the reporters were brought to the Press Interview Room under the ballpark where they had the opportunity to interview Chris Perez, Adam Everett and Vinnie Pestano. The players seemed to enjoy the questions, which I should add were pretty intense questions at times. The session ended with a group photo and will be followed by stories from each reporter of their experience during the event. Special thanks to The Cleveland Plain Dealer, Chris Perez, Adam Everett, and Vinnie Pestano for making this another successful event.